We are very pleased to announce the seventh in our colouring book range. 'Multicoloured Praises' is an A5 (14.8cm X 21cm) book consisting of 16 simple outlines based around images of faith by Mary Fleeson. Mary writes "it contains simpler designs that are less detailed and is therefore suitable for younger children as well as older children and adults who may like to add their own details. The aim of the book is to help you relax, to inspire you, to allow God to speak to you as you focus and meditate on the images. I have also included some meditations on the back of each image." Piece names are: The Star, The Cross, The Fish, Water, Wheat and Weeds, Flames, The Dove, Alpha and Omega, Butterflies, Chi Rho, Triune Knot, Palms, Bread and Wine, IHS, Shell, Prayer. 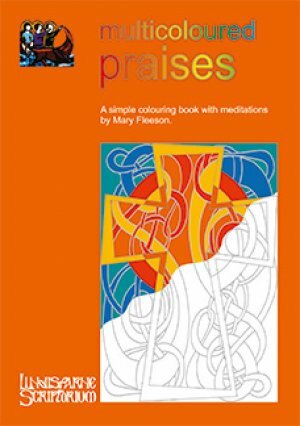 Multicoloured Praises by Fleeson, Mary was published by Lindisfarne Scriptorium in January 2014 and is our 32951st best seller. The ISBN for Multicoloured Praises is 9781909041127. Be the first to review Multicoloured Praises! Got a question? No problem! Just click here to ask us about Multicoloured Praises.